From occult underground to superhero! Was Superman's arch nemesis Lex Luthor based on Aleister Crowley? Can Captain Marvel be linked to the Sun gods on antiquity? 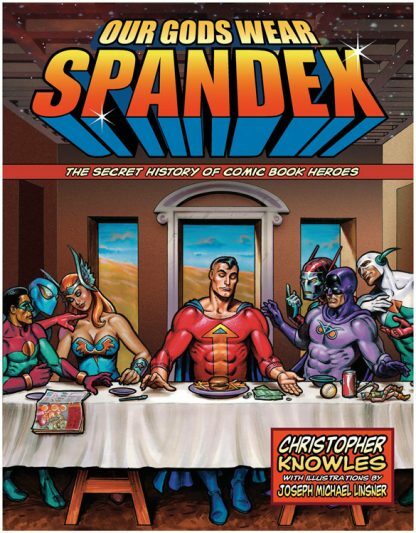 In Our Gods Wear Spandex, Christopher Knowles answers these questions and brings to light many other intriguing links between superheroes and the enchanted world of estoerica. Occult students and comic-book fans alike will discover countless fascinating connections, from little known facts such as that DC Comics editor Julius Schwartz started his career as H.P. Lovecraft's agent, to the tantalizingly extensive influence of Madame Blavatsky's Theosophy on the birth of comics, to the mystic roots of Superman. The book also traces the rise of the comic superheroes and how they relate to several cultural trends in the late 19th century, specifically the occult explosion in Western Europe and America. Knowles reveals the four basic superhero archetypes--the Messiah, the Golem, the Amazon, and the Brotherhood--and shows how the occult Bohemian underground of the early 20th century provided the inspiration for the modern comic book hero. With the popularity of occult comics writers like Invisibles creator Grant Morrison and V for Vendetta creator Alan Moore, the vast ComiCon audience is poised for someone to seriously introduce them to the esoteric mysteries. Chris Knowles is doing just that in this epic book. Chapters include: Ancient of Days, Ascended Masters, God and Gangsters, Mad Scientists and Modern Sorcerers, and many more. From the ghettos of Prague to the halls of Valhalla to the Fortress of Solitude and the aisles of BEA and ComiCon, this is the first book to show the inextricable link between superheroes and the enchanted world of esoterica. * Chris Knowles is associate editor and columnist for the five-time Eisner Award-winning Comic Book Artist magazine, as well as a pop culture writer for UK magazine Classic Rock. * Knowles worked with Robert Smigel on The X Presidents graphic novel, based on the popular Saturday Night Live cartoon, and has created designs and artwork for many of the world's top superheroes and fantasy characters. * Features the art of Joe Linsner, creator of the legendary Dawn series, and more recently a collaborator with comics maestro Stan Lee. Joseph Michael Linsner is creator of popular comic book goddess Dawn and has painted covers for many of the major comic book companies. He resides in Atlanta.